The vLocDM2 uses the latest locating and signal processing techniques to plot the current gradient of an industry standard low frequency (3Hz or 4Hz) profiling current. The current is typically applied at CP stations so the disruption of the pipeline can be minimized. The Loc-150Tx, 150W transmitter (vLocDM2 transmitter) is used to apply a signal current to the anode bed. The pipeline returns the signal via coating faults back to the transmitter. The transmitter is designed to be powered from CP (Cathodic Protection) stations, AC, DC or external battery back. 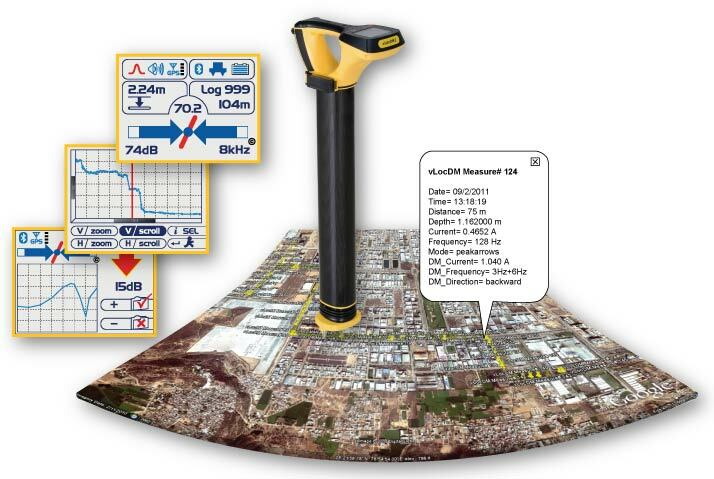 The non-intrusive measuring device, the vLocDM2 receiver, takes measurements along the pipeline and plots the results directly onto the screen of the receiver. There is no need to carry extra logging and display devices. All the data is displayed and logged into the receiver and can be downloaded to a spread sheet or dedicated analysis program. A +/- 3m accuracy GPS antenna is included with the system. It links to the vLocDM2 receiver via Bluetooth radio link. The GPS enables the user to generate real time current gradient graphs and guides the user back to a point of interest by highlighting the user’s position on the graph. This feature is called the “Walk Back” feature. The system can also be integrated with high accuracy GPS systems and software packages, for example Trimble and TriGlobal Inc.
Storing the results also has the benefit of facilitating the technique of comparative tests. Comparing the results from previous surveys of the same length of pipe allows the CP engineer to establish trends of coating deterioration. We provide professional CAT & ACVG Survey analysis. With great exposure and understanding of pipeline ROW /Site conditions; analysis done by considering near/under HT/LT installation, HDD, Turning Points, operator mistakes, Change is location of transmitter, Change in applied current, Changes in locate current etc. We provide professional CAT & ACVG Survey training. With great exposure and understanding of pipeline ROW /Site conditions; training provided by considering near/under HT/LT installation, HDD, Turning Points, operator mistakes, Change is location of transmitter, Change in applied current, Changes in locate current etc. Return for "Yearly Calibration" & "Repairs"